The Life Learning Device is a wee bit too late to be released in this day and age, where (nearly) everything you need to know is available on the Internet. 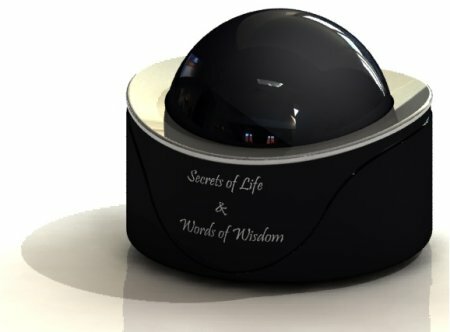 What this device does is speak a bit of its area of expertise whenever you press the top of the Life Learning Device. When you press the top of a Life Learning Device, it verbally passes tid-bits of knowledge on anything from motivational quotes, daily devotions and foreign languages to sports trivia, golf facts or studying for SAT exams. An LLD is an innovative and easier way to receive daily inspiration or expand your wisdom about a favorite hobby or vocation. Everyday it relays a new jolt of wisdom! Consistently feed your brain, soul, and desires with the touch of a button. These Life Learning Devices are an excellent way to motivate your dreams, learn a foreign language, or expand your worldly wisdom about your favorite hobby. There is a wide range to choose from, including Daily Devotions, Secrets of Life & Words of Wisdom and Spanish/English. I personally would save myself $29.95 instead of getting these and subscribe to an online site that sends me free emails of quotes and new words each day instead.